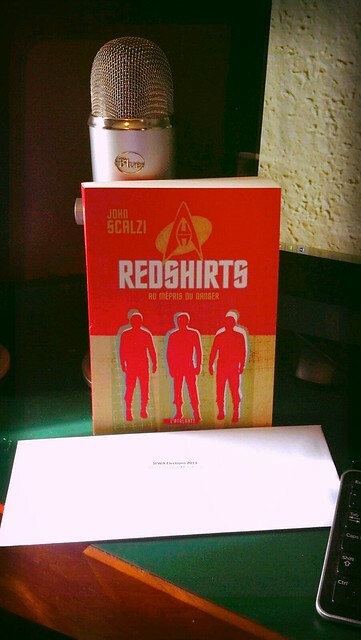 Two neat things that arrived in the mail today: One, the French language version of Redshirts, which looks nifty; and the ballot for the SFWA election, which was aesthetically functional at best but probably more important in the grand scheme of things. I’m keeping the book; the ballot, on the other hand, is going out in the mail later today. If you are a SFWA member, a few notes here. 1. 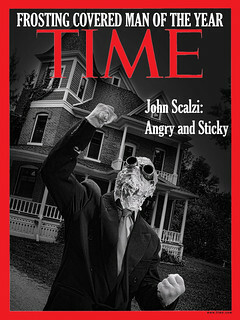 Remember to vote, please. This is actually important for the future of the organization. Please note I am not running for re-election; you will have a new president come July 1st and other board positions are being contested. Please read the candidate statements in the ballot envelope and make your choice. 2. Remember to follow the directions regarding the ballot, which means placing your actual ballot in an enclosed envelope, then putting the cover sheet and the ballot envelope separately into a second (also enclosed) envelope. If you don’t follow the steps correctly, your vote may be spoiled. Please don’t spoil your vote. As noted, there are directions in ballot mailing you’ll receive. 3. I have endorsed Steven Gould for President of SFWA. If you missed the recommendation, it is here. If my endorsement means anything to you, please check it out. 4. Currently SFWA arranges its board representation into regions; I live in the South Central Region. This year there are two candidate for the position of South Central Regional Director, both of whom I consider good friends and top-flight choices: Lee Martindale, who is the incumbent director, and Jim C. Hines. I do not believe south-central members will go wrong with either choice. That said, I can say from experience working with her on the board that Lee Martindale has shown herself to be an exceptional advocate for members, both those in her region and outside it, and on their behalf Lee has been smart, tenacious, and a clear voice on the board for their concerns, as well as a dedicated and hard-working board member. I respect her immensely, and I was and am delighted that she chose to run again. 5. I am also delighted that Rachel Swirsky and Bud Sparhawk have also chosen to run again for the board positions of Vice-President and Treasurer, respectively. I have been fortunate in my tenure as president to have excellent vice-presidents, and I believe returning Rachel to the board will offer the continuity in leadership that will serve the new president well. Likewise I believe Bud is likely to go down in history as one of the finest Treasurers SFWA has ever had; I genuinely believe him to be indispensable. 6. The organization is also been fortunate with two strong candidates for Secretary, Christie Yant and Susan Forest; I encourage every voting member to read their candidate statements and to make their informed vote from there. Likewise I am thrilled that Tansy Rayner Roberts is standing for the position of Overseas Regional Director; once again, I encourage every overseas member to read her candidate statement. Again: If you are a SFWA member, please vote. It’s important. Thanks. 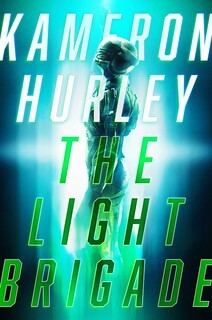 While the first two months of 2013 were not exactly empty of purpose for me — I worked on the video game and next-gen comic I’m part of the creative team for, did SFWA business, edited a book, debuted the episodes of The Human Division and managed a spontaneous fundraiser that generated roughly $70k in pledges — March starts the part of the year where I start seriously doing the year’s creative tasks, because a) two months off from that is enough for the year, b) if I want to have stuff out in 2014, now’s the time to get to it. 7. A secret project, because I always have at least one of those rolling about. Which one of these actually gets started is often contingent on which ones my brain say are ready to “drop,” that is, are formed enough that I’m ready to write them up and flesh them out more. Then again, several of these are ready to drop, so I have to decide which one is going to be the best use of my time at the moment. That’s an issue not just of interest but of career scheduling; i.e., what I want to have out there when, what things I can afford to have sink under the waves if they don’t go anywhere, and how much time/effort I can devote to things that are essentially research, i.e., things that won’t have any direct or immediate commercial value but represent an expansion of my skill set for future endeavors. Which is to say that I look at this not only creatively but as someone who is essentially running a small business, because, in the end, that’s what I’m doing. I don’t have a day job, so I have to factor commercial imperatives alongside the creative ones. This is not generally a problem for me — I tend to be unromantic about the business-related facts of what I do — but it does require some thought, and one of those thoughts is reminding myself that leading with my business brain isn’t always the right way to run a creative endeavor. There was no foreseeable business argument to writing Fuzzy Nation, for example; I did it purely because it was fun for me. But it did pretty well for me after it was written. So finding that balance between business and creative factors is worth the effort. At the moment, I’m still thinking about which longer projects to tackle, so in the short run I’m busy working on the story treatments (which are short and have a specific format, which makes them easier to do), and doing some research for the screenplay — today’s work consisted of a story treatment outline and scriptwriting research. I suspect I’ll know which longer thing I want to do in the next couple of weeks, when one of those ideas rolling about in the head finally jams itself into the “I need to be written now” slot. And thus 2013 will have structure, I’ll write something new and then the whole thing will start over with the next thing. This is not a terrible life.